After the rather complex Sankey diagrams presented in my previous post, here’s another comparatively simple one. It is presented on the website of consulting and planning company UMTAS in Germany, to support their services offers in the field of material and energy flow management. The diagram is just symbolic and doesn’t indicate any absolute quantities or a time period. It merely shows the compsition of waste. The process labeled “compost plant” seems to be a kind of sorting station, where non-compostable items such as metals are being removed. Hospital waste appears to be absent and the arrow line is shown dotted. The input and output flows of the compost plant don’t seem to match – or is this just a trompe d’oeil? 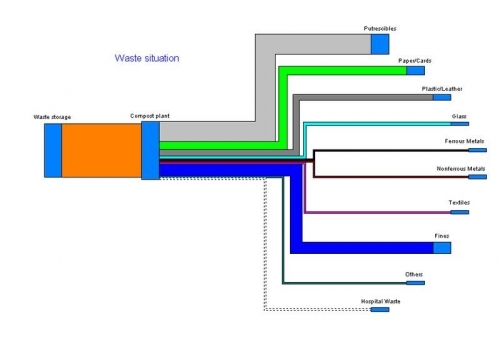 In fact, the information conveyed in this Sankey diagram is no different from a typical pie chart. [This reminds me of a categorization of Sankey diagrams I had on my to do list]. 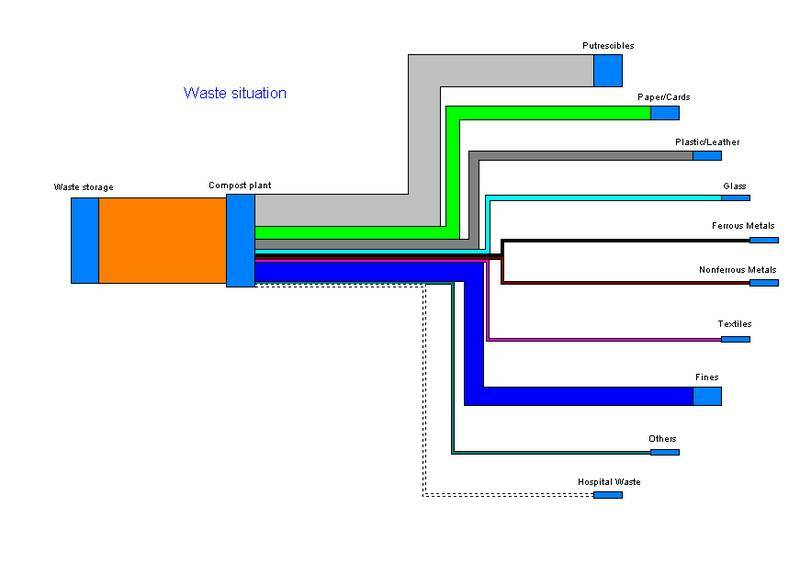 Still, I think it is a valid representation of the data, and the diagram will get even more interesting, if one starts to study where the waste flow outputs are going to and how they are treated.